A fence should be fun, too. 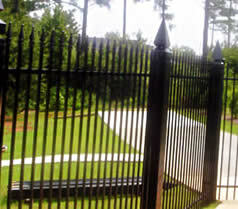 Let Quality Fence design your unique look! If it's different, then it must be a "Quality Fence". This 4' foot wrought iron fence makes a good enclosure for a dog without blocking the view of the yard. A wrought iron fence adds an upscale look to this yard. the wrought iron is also available in flat top rail. 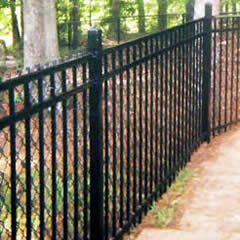 If you love wrought iron but worry that your pet might get out, then look at what quality fence has designed. Now you can have wrought iron without worries. 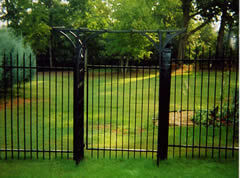 This wrought iron style was created & designed by Quality Fence. 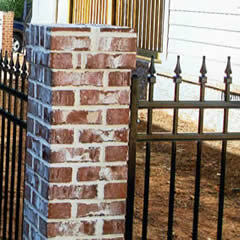 These 6 x 6 posts with wrought iron are a choice sure to place you above others. 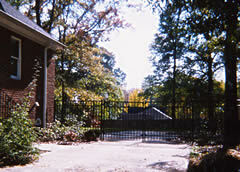 Wrought Iron fences can be beautiful, peaceful and quiet.